Back in the 90’s I traveled for a good many countries with a Canon Ixus. Great optics but as it was an APS camera it was next to useless. Expensive film processing and a format that although compact, didn’t survive. I was really impressed with the build quality, the size and the video. I shot a burst of HD video, dragged it to my macbook and had to stop for a moment. Not only was the exposure spot on in a really difficult environment, the sound was great for an almost invisible mic. So.. when passing Micro Anvika on the Tottenham Court Road I saw the Ixus 120is.. I had to have a play. The friendly staff let me pop my SD card in and shoot a test video. Once again I was blown away. This is a 12.1 megapixel ultra-compact camera the size of a pebble. It feels rock hard and it has a 28mm wide angle lens in it. Really very easy to ensure you are in the frame when video blogging. It was just too tempting I had to have it. I didn’t want to pay the street price though. I always feel the sign of a decent store is that they are flexible and willing to bend a little if you choose to haggle. There is very little movement on new camera prices and you will almost certainly get better luck when asking for a discount on memory cards etc.. Nevertheless 5 minutes later I had a new twitter friend and a camera in a bag for a price I could afford. The best camera you own is the camera you have with you when you need it. For most it is the camera on their phone and I see no reason why you cannot manage with the one in your mobile. This is (at early impressions) an interesting bit of kit. Enough flexibility in the controls. A great wide-angle.. digital zoom (which i normally never touch) when filming and great ergonomics. Optical zoom whilst filming would have been way better but there are not many cameras on the market that will do that. I will know more in the long run. 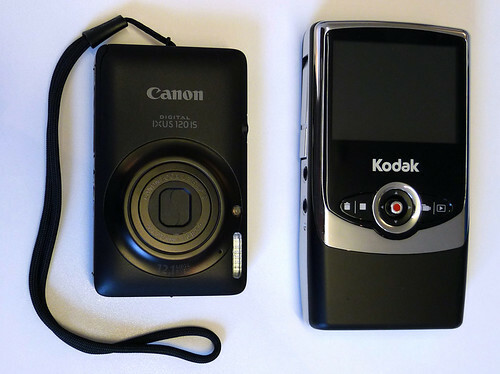 Compared to my favorite pocket HD camera the Kodak Zi6, the Canon Ixus 120is is clearly the more compact. This has meant these last few days it has been my EDC (Every Day Carry). I have shot loads of H.264 video and transfering the .mov files to my mac via the sd card slot is no less convenient than a flip out USB. This is not only a serious contender to the HD pocket cams we all love to use. This may well knock them for six. It’s not a pocket video camera you can shoot naff photos on, It’s a quality 12 megapixel ultra-compact that shoots decent HD video. Ask me when you see me or on twitter or pop into my Vimeo channel to see how I am getting on with it.. I may be having too much fun to blog a follow up. What the battery life is like? I have just bought a spare battery off ebay for £4 but have not yet needed to use it. I shoot around 80 pix and a heap of video when out and about and tend to charge my kit before each job.. I haven’t noticed it getting dangerously low like my iphone does way before it should. I think the stats say it’s good for 250 pix. I’ve had the IXUS 100is since April and am VERY pleased with it. The HD video is excellent quality and the mic is astounding – even at very loud gigs where sound would otherwise be blown up and distorted, the IXUS 100is mic manages to capture great sound. I also had the earlier IXUS APS camera (can’t remember the product #) but that was the last non-digital camera I bought. I wonder what the difference is between the 100is and the 120is ? The IXUS 80is had a time lapse feature on it which I miss on the 100is. Ah.. OK.. seems like the only difference between the 100is and the 120is is everso slightly bigger screen (.2″ diff) and x4 optical zoom, as opposed to x3 optical zoom. Otherwise the lens and sensors are identical – though the 120is is specified with a slightly wider f-stop range. I live by my Canon G9 (now their up to the G11) but I have sent mine in for repair a few times (dropped in the ocean, slid down a cliff) so the firmware is in step with G11 but retains some of the dropped features. True, it’s bigger then the 120 by a galactic scale. What is the video quality – 720HD at 15 or 30fps? I assume Canon still uses the .avi codex. I hope they switch to h.264 for my next buy. Hi AnAdventurer. It’s 30fps on all settings. Does Canon IXUS 120 captures good nice scene photos at low light?? Can anyone just post it here?? Not as good as some and better than most compacts. it is a point and shoot remember. It does not do raw.